a. Spinous processes of T7 - L5 vertebrae. b. Iliac crest of sacrum. d. Inferior angle of the scapula. e. Lower three or four ribs. Floor of intertubercular (bicipital) groove of humerus. 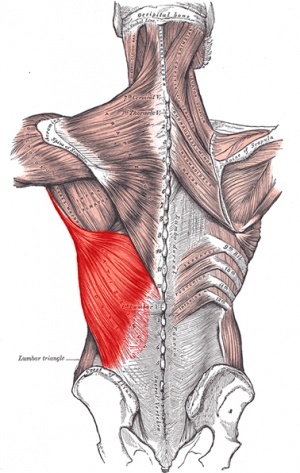 Begin this latissimus dorsi stretch standing tall with your back straight and hands above your head. Gently lean to one side until you feel a mild to moderate stretch in the side of your upper back and shoulder (figure 2). Hold for 5 seconds and then return to the starting position. Repeat 10 times provided the exercise is pain free. Then repeat the exercise on the opposite side. ↑ 2.0 2.1 Drake R L, Vogl AW, Mitchell A W: Gray's Anatomy for Students, ed 2, 2009, Churchill Livingstone.